Although services for both CNC cutting and laser cutting in Ontario produce precision parts and components, there are distinct differences between the two. If you need stainless steel or sheet metal fabricated, knowing the distinctions will help you select the right company. While both methods produce intricate parts and components and are fast and reliable, they work in unique ways. CNC, the acronym for Computer Numeric Control devices, uses specialized tools to quickly and efficiently produce products. With CNC cutting, an expert creates a design based on what the customer needs using a software program like CorelDRAW or AutoCAD. Once the designer feels satisfied with the drawing, he or she places a piece of metal or some other material on the cutting surface. The computer sends a signal to the CNC machine, which in turn, interprets the design. With a prototype that meets all requirements, the operator can process multiple products. For this machine to cut, the tool moves back and forth as well as side-to-side along the axes while following the shape of the design. Like CNC cutting, a CNC system guides the laser metal cutting machine. The difference is how the cutting occurs. Instead of a cutting tool, a laser relies on heat to create the desired shape of the product. While traditional CNC cutting carves out the design, laser cutting relies on a high-energy light beam that burns through the metal material. Although this type of cutting does not work for every application, it does offer several unique advantages. Precision – A primary reason for having parts and components fabricated with a laser metal cutting machine is the incredible precision. With CNC cutting, the tool has limited widths. For instance, the smallest radius is only slightly under 1mm. In comparison, a fabricator can set a laser bean to as little as 0.1mm. That makes it possible to achieve detailed cuts with tremendous precision. Cleaned and Sealed Edges – Because laser cutting involves burning, edges are always clean and sealed. Not only does this improve the functionality of the finished product, but it also enhances appearance. 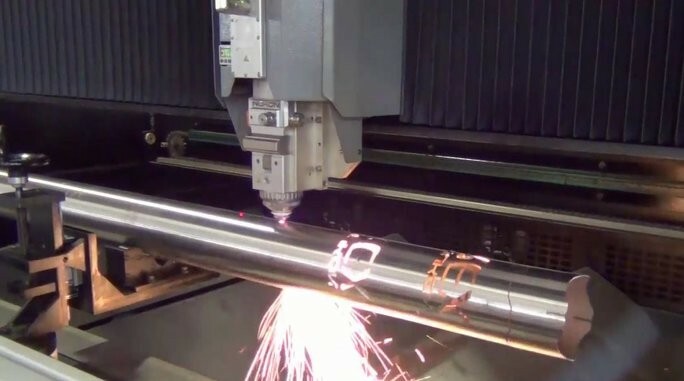 At Weldflow Metal Products, we have the experience and expertise to help with any laser cutting need using a fiber laser cutting machine, which is fast, cost-effective, safe, and precise. Call or visit us online to learn more. This entry was posted in Laser Cutting and tagged laser cutting. Bookmark the permalink.